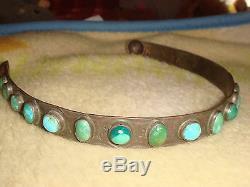 Presenting a rare'Museum Quality', Old Pawn, Sterling Silver (maybe coin or ingot), and blue, and green Turquoise headband/hairband. 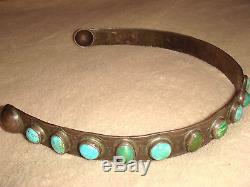 From the Fred Harvey era, this unique hairband, features nineteen, round and oval Turquoise stones. There is creative stamping of horses, arrows, and other traditional stamping in the Navajo tradition. It measures approximately 14", over the top, 12" from underneath, X over 5/8 wide. The headband is perfectly shaped, and wears perfectly with long hair. Weight is approximately 50.4 grams. I have never seen another one like it. It is unpolished, exhibiting a very dark aged patina. 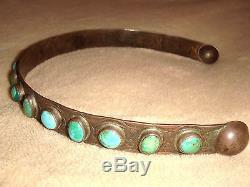 Perfect Vintage condition, with perfect Turquoise stones. Showcased for over thirtyfive years, and I wore it for fifteen. Part of my personal collection. 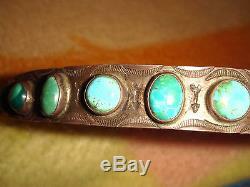 The item "OLD PAWN FRED HARVEY ERA NAVAJO MUSEUM QUALITY STER. 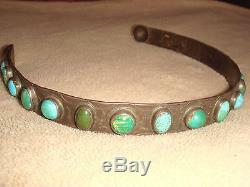 SILVER TURQUOISE HEADBAND" is in sale since Thursday, July 13, 2017. 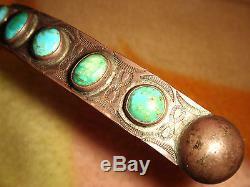 This item is in the category "Collectibles\Cultures & Ethnicities\Native American\ US\1800-1934\Jewelry".ron" and is located in Lambertville, New Jersey. This item can be shipped to United States, Canada, United Kingdom, Denmark, Romania, Slovakia, Bulgaria, Czech republic, Finland, Hungary, Latvia, Lithuania, Malta, Estonia, Australia, Greece, Portugal, Cyprus, Slovenia, Japan, Sweden, South Korea, Indonesia, Taiwan, Thailand, Belgium, France, Hong Kong, Ireland, Netherlands, Poland, Spain, Italy, Germany, Austria, Israel, Mexico, New Zealand, Singapore, Norway, Saudi arabia, United arab emirates, Qatar, Kuwait, Bahrain, Croatia, Malaysia, Colombia. 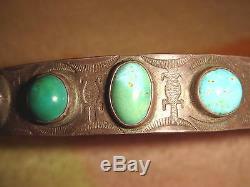 Rare Navajo hairband: Pre Fred Harvey era.